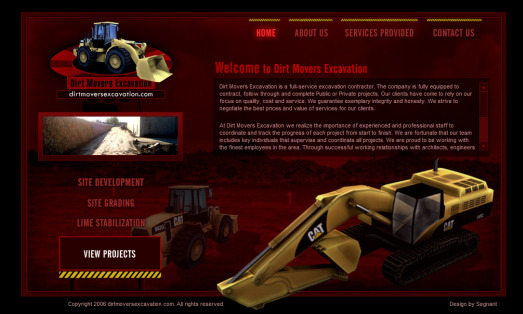 Dirt Movers Excavation is a full-service excavation contractor. The company is fully equipped to contract, follow through and complete Public or Private projects. 1. About Us page: This page provides detailed information about the company. 2. Services page: Here the different types of services are listed. 3. View Projects page: This section displays various projects with photos and descriptions. Segnant has made the whole process of finding the past projects and services related information not only easy to find, but also interesting through the use of graphical layouts and a clean navigation menu.